Dr. Capolungo will join Georgia Tech in spring 2010 as an Assistant Professor at Georgia Tech Lorraine in Metz, France. Prior, he was a Postdoctoral Fellow in the Material Science and Technology Group at Los Alamos National Laboratory, where he focused on studying the deformation behavior of low symmetry materials (Mg, Zr, Be,U..) of interest to the automotive and nuclear industry. Mechanics of Materials: Computational material science, materials processing, constitutive laws, and material deformation. Dr. Capolungo’s current research interest consists of studying the mechanical behavior (and relations with processing) of nanostructured and coarse-grained metals with low symmetry. These studies rely equally on the use and development of computational tools (e.g. , molecular dynamics, dislocation dynamics, self-consistent schemes) and of experimental devices (for example, scanning electron microscopy, orientation imaging microscopy, and neutron diffraction). Such techniques allow investigation of atomic scale defect nucleation and interaction in metals and their relationship to the materials response. Twin nucleation and motions in low symmetry crystals with application to the cases of magnesium and shape memory alloys. 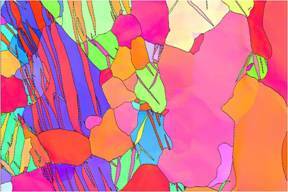 Static and dynamic recrystallization in hexagonal and orthorhombic polycrystals. Grain boundary motion and interaction with dislocations. These projects will be of interest to graduate students in mechanical engineering who want a deeper knowledge and understanding of theoretical and computational mechanics with applications to novel materials. 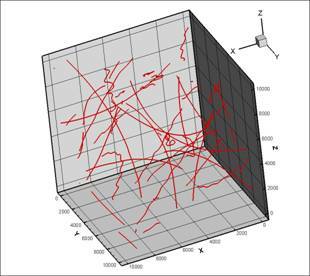 Dislocation dynamics simulation of pyramidal slip in magnesium, (b) Orientation imaging microscopy of twinned magnesium. M. Cherkaoui and L. Capolungo. 2009. Atomistic and Continuum Modeling of Nanocrystalline Materials: Deformation Mechanisms and Scale Transition. Springer, New York.